1. Preheat the oven to 200ºC, gas mark 6. Blanch the courgettes in boiling water for 5 minutes then drain and cool. Wrap each half in a slice of ham. 2. 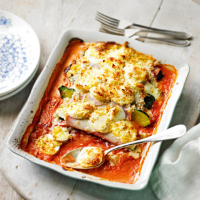 Place the tomatoes in the base of an ovenproof serving dish and top with the courgettes. Lay the egg slices on top of the courgettes. 3.Heat the sauce a little before pouring over the dish. Sprinkle with breadcrumbs and bake for 20–25 minutes until golden and tender.